Call A to Z Entertainment, Inc. today for free information about how to hire or book country music singer Frankie Ballard. With over twenty years of successful experience, we are your best agency for booking and hiring country musician Frankie Ballard! We book and help you hire any live professional entertainment you want, including live country music singers, country musicians, and live country music bands. We also help you plan and produce your event. So call us today at 888-655-4575 and we will be happy to help you. The best music is about connection, that place where words and music allow an artist’s reality to fire real emotion in listeners. And it’s just that connection that has been at the heart of Frankie Ballard‘s rise as an artist. Nowhere has that been more evident than in Ballard’s breakthrough #1 hit, “Helluva Life.” Fans are owning every line as they sing it back in concert and use social media to share their own stories of good times and bad, and the way romance puts a shine on all of it. As they sometimes do, the song’s maxim that “bad times make the good times better” has become a rallying cry and a life-affirming motto. It also rings true to the life Frankie Ballard himself has been living. “Helluva Life” is the opener from Sunshine & Whiskey, an album that announces Ballard as one of the genre’s most nuanced singers and writers, someone whose long road history and wide musical taste add substance to his obvious surface appeal. He first hit the public spotlight with two Top 30 singles, “Tell Me You Get Lonely” and “A Buncha Girls,” appearing on the Grand Ole Opry and playing packed arenas opening for Kenny Chesney and on major tours with Taylor Swift and longtime idol Bob Seger. But he took a different musical approach for Sunshine & Whiskey. The fun side includes “Whiskey” and “Drinky Drink,” about which Ballard says, “I’ve been making music for a living for about ten years now and I’ve found myself in a bit of trouble from time to time. The two things that always put me there—women… and whiskey.” “Don’t You Wanna Fall” is about a singer, “a high-wire act without a net,” with a woman he wants off the pedestal he’s put her on. “He’s saying, ‘Come down here to my level where it’s real,’” Ballard says. At the deep end is “Don’t Tell Mama I Was Drinking,” a song that hearkens to the stories of tragedy and despair that were once a country mainstay–“It sounds like something Waylon Jennings would cut,” he says. That diversity is a key component of the record. In fact, it was those earlier recordings that led Ballard to his re-energized approach to writing and recording Sunshine & Whiskey. What had been missing, he realized, was a blue-collar sense of crafting his own product from the bottom up, of putting his stamp on every step of the process. He decided to retool, looking for a like-minded producer, and his search led to Altman, whose work with “bayou soul” singer Marc Broussard he was particularly fond of. The excitement translated easily to his team. “I knew and the label believed I was making music that mattered,” he says. In fact, legendary producer and label exec Scott Hendricks (Trace Adkins, Blake Shelton, Brooks & Dunn) signed on as co-producer, providing additional direction. The album, Frankie Ballard says, “represents the beginning of what people will call my sound.” It’s a mixture of influences, from country classics to blues legends, from Southern rock to contemporary sounds, all held together by the force of his artistic personality. Like heroes including Willie Nelson and Hank Jr., he makes everything he touches his own, a result, more than anything, of a decade of honing his craft on stages all over the country. They will hear his background in every note. 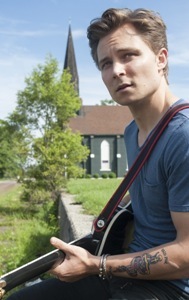 Frankie Ballard is a product of Battle Creek, Michigan, a working-class town where he grew up “loving Elvis and Johnny Horton.” Sports-obsessed as a kid, he played baseball at Western Michigan University, while he gradually turned a minor interest in music into his main passion. He studied guitarists, including blues great Buddy Guy, locking himself away until he could excel at the instrument. He began playing open mic nights and played drums in a band. By the time he was out of college, he was leading his own band, playing 200+ nights a year within a 300-mile radius and taking trips to Nashville once-a-month. Through it all, he has never lost his love for doing what he does best–taking his music to the people. Capturing the essence of his energetic stage shows, Sunshine & Whiskey represents the perfect re-emergence for a singer whose journey reflects all of life’s ups and downs. We’re your best talent agency and agent for booking and hiring country music singer Frankie Ballard, so call us at 888-655-4575 today and we’ll be happy to help you. We can help you book and hire any live country music bands and country singers in addition to those you see here on our site. We are not the exclusive agency of any live entertainers on this site, but we’re the best.